Note: If you are looking for a review of how the Cleo Jude compares to the Cleo Neve, click here to read it! Well, gentle readers….guess what? I found a bra that fits! I had put the Jude into the categories of “too bad it’s moulded, because they don’t fit me” and “it’s not supposed to be good for shallow breasts.” However, I tossed it in a pile of bras at Alice Rae and it was love at first try. Cleo by Panache Jude (image from Panache). My Jude is purple and navy – and I like it! Cleo by Panache Jude 38E – purple and navy. The Jude is bandless, and also side-seamless…I don’t know if the seamlessness affects fit but I did notice the lack of side seam. The Jude definitely qualifies as “not alot of bra” in band height and gore height. Look Mom, no side seam! What makes the Jude work for me? 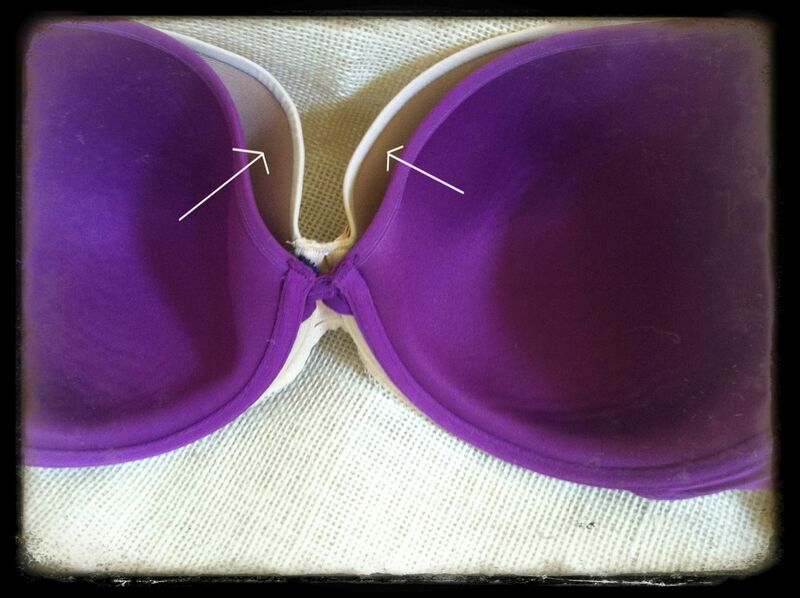 I compared it to my Freya Deco 36FF – and this is the difference in the cup style that I found. In case you are wondering, I did try the Freya Deco in a 38F, 38E, and 36F…all sizes collapsed in the same areas, and the smaller cups did not give enough coverage and support. Here’s how the Jude breaks down…. Band: The Jude is bandless, which in this bra works well for me. I do sometimes have issues with arched center panels (I wish most of them weren’t…) because the cups tend to be very round and deep, and poke into my ribs when I sit down (curse of the short waist) – I do notice the bottoms of the wires push into my ribs just a bit, but only at the end of the day while sitting (and slumping). The band does not jam into my armpits. Gore: The Jude’s corded gore tacks perfectly. Wires: The Jude’s wires fit me well. I would describe them as deep winged U’s. The wires stretch to form wider wings when worn. Normally, I would pass on wires this deep (and I did for a long time); however, perhaps because the corded gore allows quite a bit of position adjustment on my breasts (or some other feature of the Jude I’m not adequately appreciating) the cups fit very well. Cups: The microfiber cups are definitely moulded, but are not as thick and inflexible as the Freya Deco, nor as malleable as the Fantasie Rebecca. The shape does a great job of moving my breasts front and center – another improvement for me compared to the Deco, which allowed outer spread and made me look wider. I did go down a cup size from an F to an E in the Jude – I think this is because my soft breasts fill a smaller, moulded space better and I get more lift. This is consistent across brands for me (I did this in Chantelle, also). Straps: The Jude straps are quite narrow, and I do wish they were a bit wider. I must be conscientious about tightening them to the perfect length for the best support and fit. The straps are not wide set, and do not irritate my pectorals or armpits. Conclusion: The Cleo Jude is my Freya Deco – if the Deco doesn’t work for you I do suggest giving the Jude a try. As a note, I have tried the Panache Porcelain and I think the Jude fits me better, and has more malleable cups. If you are high set or short waisted, definitely give the Jude a try. There’s no gore to poke close-set breasts and I think the Jude is very comfortable. I have ready many reviews about the Jude from shallow shaped women, and it does not seem to work for shallow shapes – I think it works for me because over time and as my cup size grew, I’ve become more lower/mid full. As a bonus, the Jude is part of Cleo’s Everyday Essentials collection…so it is usually well stocked in several colors at online and storefront retailers. Update: Erica from A Sophisticated Pair just informed me they are replacing the Jude with the Neve in a few months…so buy them while you can (just don’t buy mine…). For more detailed measurement information visit my review on Bratabase! Excellent review! Sadly, they are discontinuing this style a few months and replacing it with the Neve. I’m hoping the fit is essentially the same and that they have only changed the aesthetic details. It’s a great bra and makes a nice alternative to the Deco. Plus, the colors are always so fabulous too! Well, you know what I’m buying a few of. Grrrr…. And big THANK YOU for the heads up. Geez. I can’t win…. Yeah… story of my life. As soon as I find well fitting bra they discontinue it (or it happens to be already discontinued, but surfacing on ebay). I really sympathize. But the good thing – you can make some strategic stocks beforehand this time. Thanks! I only wish they were still making it. I’ll try the Neve soon and report in.